Archbishop Thomas Wenski preached this homily at the Mass marking the start of a daylong Evangelization Summit organized by the archdiocesan Office of Evangelization and Parish Life. The summit took place March 16, 2019 at Msgr. Edward Pace High School in Miami Gardens. I thank every one of you for being here for today’s Evangelization Summit. What you do – and each of you in what you do helps to advance the mission of the Church here in South Florida – and as the chief pastor of this local Church I am grateful for what you do – and I am grateful that you do what you do with great love and dedication. 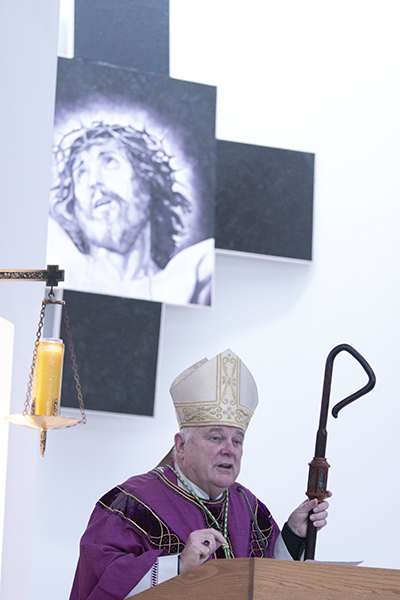 Archbishop Thomas Wenski preaches the homily during the Mass that opened the archdiocesan Evangelization Summit, March 16, 2019, at Msgr. Edward Pace High School in Miami Gardens. But one reason we are here today is that 2000 years after Jesus gave us the “Great Commission,” we got a whole lot more work to do: Many people have yet to know Jesus Christ, others have drifted away from him, and growing numbers either because of the hostility of the culture towards faith, or because of our own sinfulness, do not look to us to tell them anything about him. Our life in Christ, because of our inconsistencies and incoherence, too often fails to convince. The statistics tell a sobering story. Pew Forum on Religion and Public Life states: “The Roman Catholic Church has lost more members than any faith tradition because of affiliation swapping ... While nearly one in three Americans were raised Catholic, fewer than one in four say they’re Catholic today. That means roughly 10 percent of Americans are ex-Catholics.” Thanks to immigration, the number of Catholics in the U.S. remains at about 24 percent of the population. One in three Catholics in the U.S. is Hispanic. Our faith needs to be attractive. In fact, that’s how the Gospel won over the ancient world. “See how they love one another.” The love of the first Christians – even towards their enemies – was attractive. In my college days, I remember reading the psychologist, Carl Rogers. In training new counselors, he insisted that a counseling relationship would not be successful unless the counselor had “unconditional positive regard” for his clients. If Peter and Paul and all the saints of the primitive Church labored and struggled and suffered martyrdom to bring the Gospel ad gentes, it was because they felt that these souls were worth saving. They preached the Gospel to the house of Israel and then to the Gentiles. They preached uncompromisingly – but with unconditional positive regard for the pagans they sought to save for Christ. That same “unconditional positive regard” should still motivate our missionary activity today. In other words, you will not “evangelize” anyone if you do not enter into a relationship that shows “unconditional positive regard” for them: You got to love them. 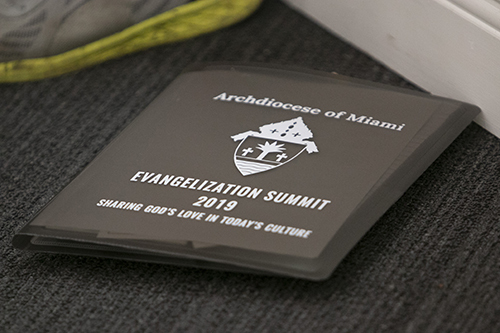 Folder received by participants at the archdiocesan Evangelization Summit, March 16, 2019, at Msgr. Edward Pace High School in Miami Gardens. Allow me now to introduce a Marian theme here. The Virgin Mary is our model of evangelization. Mary did not communicate to the world an idea; she gave birth to a son. We must always remember this – our faith is not about an idea, an opinion, an ideology or a theory; our faith is not even primarily about ethics and teaching people how to be good. Our faith is about an encounter, an encounter with a person, Jesus Christ, who invites us into a relationship with him, a relationship in which he calls us his friends. Mary was the first disciple, the first Christian. She shows us that Christianity is not a series of “noes” but a lived “yes” to a living person, Jesus Christ. St. John Paul II with good reason called Mary, under the advocation Our Lady of Guadalupe, the Star of the New Evangelization. The story of Guadalupe is amazing: Almost 500 years ago, Mary appeared to a poor Indian peasant, Juan Diego. Her image was left on his cloak – and is still venerated at her shrine in Mexico City, five centuries later. More amazing than this miraculous image of La Guadalupana is the fact that in her the indigenous people of Mexico, conquered by the Spaniards, saw someone who looked like them. She spoke to Juan Diego in his native tongue. The complexion of her skin, the clothes she wore communicated to him and to millions of his countrymen that she was “one of them.” More than anything else, this helped communicate to the Indians the fact that the Gospel was for them – and not against them. Within 10 years of the apparition more than 3 million of Mexico’s native populations were converted to Christianity. The speed and the success of the evangelization of Mexico is unparalleled in the history of Christianity. The Mexicans embraced the faith because they felt embraced by Mary. Many today would discount this – they allege that Christianity was brought by the sword, by force. The reality is quite different – the evangelization of Mexico succeeded not because of the sword – it succeeded despite the sword, despite the counter witness of so many who, while they bore the name Christian, did not live up to the demands of their faith. Despite the sins of the conquistadores, those Indians who gods had demanded that they sacrifice their children saw a faith in a God who sacrificed his Son for them as very attractive. People today are being sacrificed on altars erected to the false gods of our age. These are the same ancient gods of power, pleasure and plunder dressed up in new disguises. The human sacrifices they demand continue in our day. The inconvenient are disposed of through abortion and euthanasia. An epidemic of addiction kills more people every year in the US than died during the entire Vietnam War. We see a globalization of indifference and complacency towards the migrant, the poor, the marginalized. We must make to the world an attractive proposal about a God that does not want death for us but life, a God who so loved the world that he gave us his only begotten Son so that we might have life – abundant life. Our efforts to evangelize will bear fruit if Mary does for us what she did in Mexico and allows the Gospel to be seen by our contemporaries as not against them but for them, not taking away their freedom but allowing them to know the true freedom of the Sons of God.